Vivitrol (naltrexone) blocks the effects of narcotic medicines and alcohol. Vivitrol may also be used for other purposes not listed in this medication guide. Do not use narcotic drugs or alcohol while you are being treated with Vivitrol. Never try to overcome the effects of the medication by using large doses of narcotic drugs or alcohol. Doing so could result in dangerous effects, including coma and death. Ask your doctor before using any prescription or over-the-counter medicine to treat a cold, cough, diarrhea, or pain during your treatment with Vivitrol. These medicines may contain narcotics or alcohol. Vivitrol may impair your thinking or reactions. Be careful if you drive or do anything that requires you to be awake and alert. You may notice pain, redness, bruising, swelling, or a hard lump where the medication was injected. Call your doctor if you have this type of reaction to the shot, especially if it does not clear up or gets worse within 2 weeks. Wear a medical alert tag stating that you are being treated with Vivitrol, in case of emergency. Any medical care provider who treats you should know that you are receiving this medication. Additional forms of counseling and/or monitoring may be recommended during treatment with Vivitrol. If you have any of these conditions, you may need a dose adjustment or special tests to safely receive Vivitrol. FDA pregnancy category C. It is not known whether Vivitrol will harm an unborn baby. Tell your doctor if you are pregnant or plan to become pregnant while using this medication. It is not known whether naltrexone passes into breast milk or if it could harm a nursing baby. Do not use Vivitrol without telling your doctor if you are breast-feeding a baby. Vivitrol injection is injected into a muscle. Vivitrol is usually given once a month (every 4 weeks) and can be given only by a doctor or nurse in a clinic. It is important to receive your Vivitrol injections regularly to get the most benefit. Wear a medical alert tag or carry an ID card stating that you use Vivitrol injection. Any medical care provider who treats you should know that you are receiving this medication. Call your doctor for instructions if you miss an appointment to receive your Vivitrol injection. What should I avoid while using Vivitrol? Vivitrol may impair your thinking or reactions. Be careful if you drive or do anything that requires you to be awake and alert. 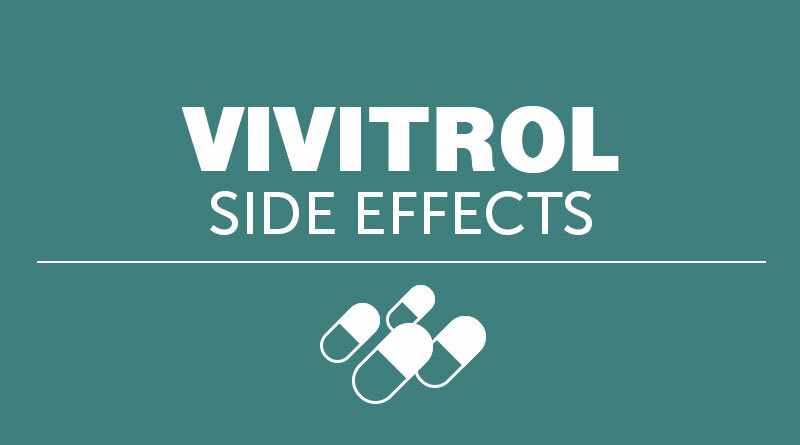 Do not use narcotic drugs or alcohol while receiving Vivitrol. Never try to overcome the effects of the medication by using large doses of narcotic drugs or alcohol. Doing so could result in dangerous effects, including coma and death. Ask your doctor before using any prescription or over-the-counter medicine to treat a cold, cough, diarrhea, or pain while you are being treated with Vivitrol. These medicines may contain narcotics or alcohol. pain, redness, bruising, itching, swelling, oozing, skin changes,or a hard lump where the medication was injected. What other drugs will affect Vivitrol? The pain-relieving effects of any narcotic pain medications you use will be blocked if you use them during your treatment with Vivitrol. Harmful side effects could also occur. This list is not complete and there may be other drugs that can interact with Vivitrol. Tell your doctor about all the prescription and over-the-counter medications you use. This includes vitamins, minerals, herbal products, and drugs prescribed by other doctors. Do not start using a new medication without telling your doctor.